The Township’s Clerk and Treasurer provide Notary Public Services on behalf of township residents and non-residents. Typical hours are 9:00am to 5:00pm, Monday, Tuesday and Thursday; however, please call ahead 616-896-8376 to confirm a Notary will be available. There is no charge for the service. You will need to bring proof of identity, such as a driver’s license, passport or state issued personal identification card. Please do NOT sign any documents until you are before the Notary. 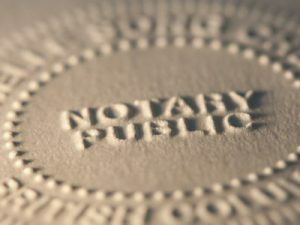 A notary public is an officer commissioned by the Michigan Secretary of State to serve as an unbiased and impartial witness. The most common function of the notary is to prevent fraud by attesting to the identity of a person signing a document. Notarization on a document certifies that the person whose signature is entered on the document personally appeared before the notary, established his or her identity, and personally signed the document in the presence of the notary.